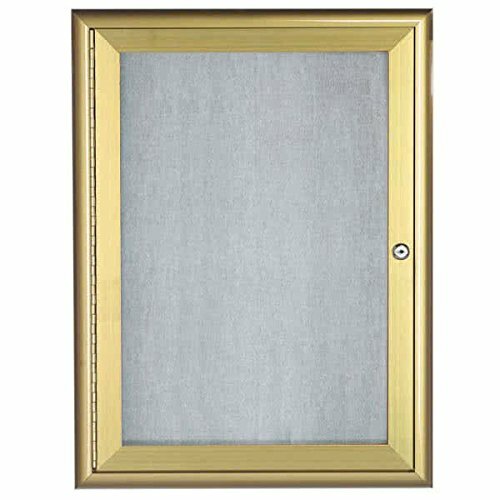 Display important information outside hotels, offices, schools, or restaurants with this TableTop King OWFC2418G 24" x 18" gold enclosed aluminum indoor / outdoor bulletin board with waterfall style frame! With a durable, attractive gold aluminum construction, this enclosed bulletin board allows you to creatively present menus, announcements, or schedules. The waterfall style frame even adds an extra layer of interest to elegantly frame posted information. Boasting a tackable surface, you can efficiently display multiple messages or specials for your guests in this enclosed bulletin board. Its clear, acrylic safety window ensures ample visibility and protection from the elements, while the lockable door helps prevent tampering. Continuous door hinges even allow for smooth opening and closing.